Singapore’s Amazing 3 In 1 Fusion Dessert! As any foodie is sure to attest, one of the joys of traveling to a new country is being able to sample the unique cuisine that may not be available in their home country. Almost any country that a person may travel to will play host to a wide variety of culinary delights that are as much fun to sample as any of the cultural hotpots that particular country may have to offer. If you happen to travel to Singapore perhaps the best example of this is the amazing three in one fusion dessert that is fairly easy to find in most traditional Singaporean restaurants. This is a dessert that has been catered towards the Singaporean taste for coconuts but if you dig a little bit further you will find that it also plays host to a number of wonderful surprises to tantalize your taste buds. Upon receiving the dessert you may be a little bit surprised to find what looks like an entire coconut sitting on your plate. The Singaporean preference for the fruit is immediately apparent and you may be forgiven for thinking that the main treat here is going to be the succulent milk that the coconut is known for. Rest assured the milk does play a huge part in the making of this stunning dessert but it’s only one part of a cohesive whole. Your coconut will come with a removable top that reveals the real hidden treasure of the fusion dessert. Opening your coconut will reveal that it has been filled with a gorgeously thick almond cream. This is a traditional recipe that has delighted many diners for years just as a standalone dessert, but here it is just the first step to a true taste sensation and digging a little deeper into it will reveal the other ingredients that make up the dish. Dig your spoon in a little bit deeper and it will come up filled with a beautiful serving of Yam Paste. This traditional Chinese dessert is also known as Our Nee in some areas so be sure to check you menu or ask your waiter to confirm one of the two has been used. The lard used to create this dessert is what gives it is lovely smooth texture. This is not one for those who are counting their calories but is a stunning indulgence for people who partake in its delights. We mentioned earlier that the coconut absorbs the flavours of the desserts inside it and that becomes apparent once you finish the contents and move onto the coconut flesh. The heating process will have made it nice and tender and you will note familiar tastes blended with the natural taste of the coconut to top off the dessert. 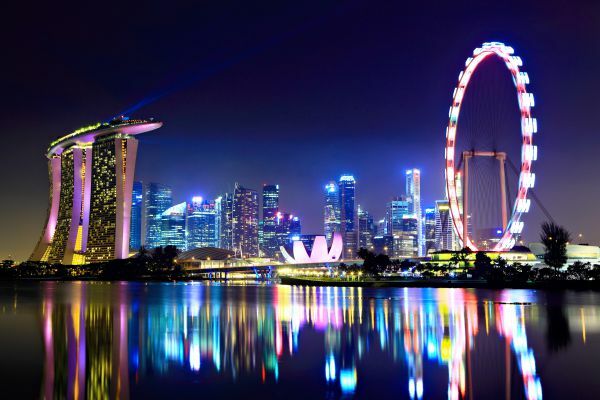 One of the best things about travelling to Singapore is that you will generally not need to secure an ESTA to experience its delights. All the more reason to pay a visit and experience what this wonderful country has to offer.